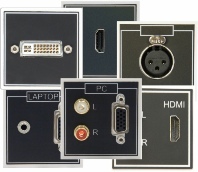 A versatile range of ‘snap in’ AV interface adapters to fit UK, European and US 50mm euro format plates. For the ultimate in flexibility and convenience the attractive iKON Euro modules cover most common AV and home install requirements. 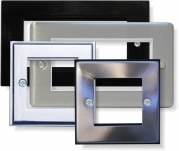 Use with our expanding range of panels, media plates and desk modules for a great looking and performing panels.